LEGO seems to be everywhere lately, at least in my eyes, anyway. There have been two video games released by LEGO lately which incorporates it's brick-constructed world for some awesome gaming: LEGO Battles Ninjago and LEGO Star Wars III: The Clone Wars. I also featured some snazzy looking earphones for the musicphile that looked like they were made by LEGO themselves not so long ago, the Playbrick earphones. Now I've found two more LEGO-inspired items that are not only decorative but are also fully functional; fun and quirky to look at and a pleasure to use. And since Firebox insists on producing a whole host of other LEGO-tastic products, expect more of these coming along your way in the coming weeks. It would have been nice if they had equipped these LEGO bottles with limbs that can be used as handles but these LEGO bottles still deliver and can be used to do what they were made for in the first place. 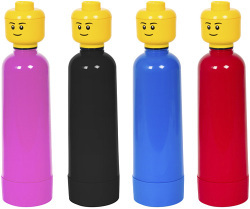 The caps of these LEGO bottles are actually the heads of your figures so it's off with their heads every time you want to take a swig of your drink or water from the bottle. These are available in four basic colors: blue, pink, red, and black. Personally, I prefer the blue one. The LEGO bottles look a bit creepy in their limbless state but at least they're dishwasher safe, right? They can also hold a volume of 400 ml of your drinks of choice and stand at approximately 25.6 cm tall. I wish I had one of these back when I was still a kid so lunch wouldn't have been such a boring time for me. If your child is a picky eater who keeps on forgetting to bring his lunch tote or paper bag with him to school then maybe this might change his (or her) mind. 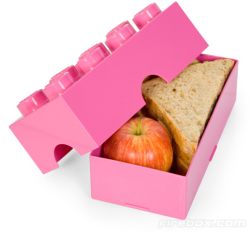 The LEGO lunchbox is available in four bright colors: blue, pink, red, and black, just like the LEGO bottles mentioned above. Get a pair of them in matching or complementary colors and have a truly LEGO-inspired meal on the go.